The mountain-climbing rover heads for Mount Sharp, rising 3 miles (5 kilometers) above Gale Crater. The mountain-climbing Curiosity rover is targeted to land in Gale Crater, located on the equator of Mars, on Aug. 5, 2012. Mount Sharp, Gale’s central peak, rises 3 miles (5 kilometers) above the crater floor. The site is poised between Mars’ flat northern lowlands and the heavily cratered southern hemisphere. Curiosity’s goal is the layered mound of debris making up Mount Sharp. 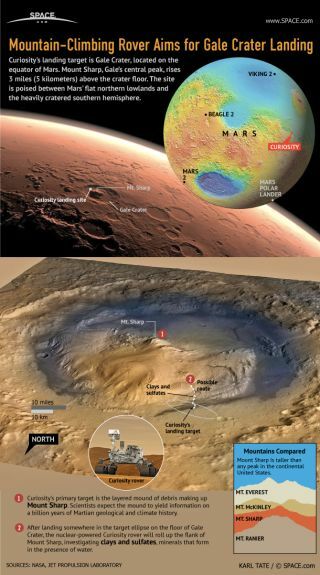 Scientists expect the mound to yield information on a billion years of geological and climate history on Mars. The rover will also investigate a mysterious material on the floor of Gale Crater called the “high thermal inertia unit.” This material is solid like rock and not loose like sand. It could be sand cemented together by the action of water. As the mission progresses, Curiosity may eventually drive all the way to the top of Mount Sharp, but summiting is not the scientists’ main goal. If all goes well, Curiosity’s equipment could last six years or more.